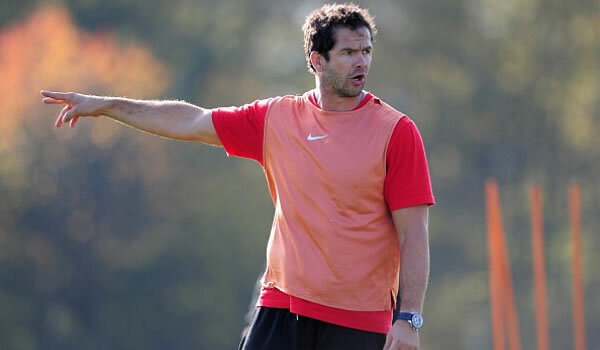 Saracens chief executive Ed Griffiths has insisted he is looking to resolve the future of the club's coach Andy Farrell next week. The Aviva Premiership champions are keen to keep hold of the former Wigan Warriors rugby league star, who has greatly impressed in the coaching department of the 15-man game. Farrell worked alongside Graham Rowntree and head coach Stuart Lancaster with England during the Six Nations this season, which saw the national side finish second behind Grand Slam winners Wales. The RFU are looking to lure Farrell to the job alongside Lancaster on a more permanent basis but his club side are keen on keeping hold of him. With Saracens set to take on Clermont Auvergne in the quarter-finals of the Heineken Cup on Sunday, Griffiths wants the matter resolved. "We would like to (resolve it) because we don't want any 'will he? won't he?' distractions going through the Clermont week," he said. "It is like any kind of discussions. "You would like an early settlement but we will see. "We will have more discussions this week."